If you resided in Middle Earth during the Third Age,* which of the major characters might you have been? Boromir,** Pippin, or perhaps Gandalf himself? And, we’re only talking about the “good guys and gals.” We’ll have no one identifying with villains like Saruman, the Nazgûl ringwraiths or Grima Wormtongue here at Mere Inkling! In a moment, I’ll help you answer that question. Unfortunately, the internet abounds with time-consuming black holes. Pouring minutes and hours of our lives into the abyss of mindless videos or addictive games is the sad result. Some entertaining diversions, however, possess merit. Case in point, an analysis of the leaders of Lord of the Rings, arranged according to their personality types. Visiting a website such as this is not only fun, it offers insight into human differences. And, for the unwary, it may even reveal some new insights into our own nature. 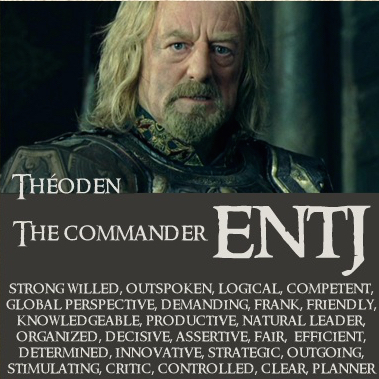 My own type is ENTJ, which matches with King Théoden above. As I age, however, I am finding myself less extraverted and more desirous of solitude. That means I am progressively becoming an INTJ, and that aligns me with Elrond. Frankly, both of the characterizations suit me quite well. A person’s type is determined by which of four polarities is dominant. If you don’t know your type, and have the time to take an online assessment now, you can do so for free here. You don’t need to do it to enjoy the Lord of the Rings chart though. So, which are Middle Earth leader are you? Find out here. While instructive, tools such as this should never be used to put people into boxes (which is ironic, since the MBTI is graphically presented in that fashion). The last thing we need is someone thinking they are defined by a psychological instrument such as this. After all, today’s Gimli may just well be tomorrow’s Bilbo. * The complete timeline of Middle Earth is available here. ** I have written in the past about the hero Boromir.